Urban Sprawl: in 2009, 80% of the people in the world lived in or near a town or city. In the state of Washington alone, over 35,000 acres of wildlife habitat are destroyed or degraded each year for housing and other development. Rural settings are no longer safe havens for native species due to monocropping, GMOs, and pesticide use, causing wildlife to immigrate into cities and suburbs in the search of food and shelter. Urban public spaces, parks, yards, and parking strips appear green, but are often planted with turfgrass and exotic or invasive plants which offer little or no sustenance to native fauna. Worryingly, the ﻿EPA ﻿reports that homeowners in the U.S. use 70 million pounds of herbicides & pesticides per year. The ugly reality is that your backyard may be laced with a toxic cocktail of chemicals that are deadly. Of 30 commonly used lawn pesticides 19 are found in our groundwater, 22 are toxic to birds, all 30 are toxic to fish and aquatic organisms, 29 are deadly to bees, and 14 are toxic for mammals; some fungicides and pesticides can kill 60-90% of the earthworms where they are applied. In addition, the EPA reports that the run-off from lawn care products into our fresh water includes carcinogens, hormonal disruptors, and neurotoxins, and that there are no federal regulations for these products. There is a growing back-to-the-land movement in many parts of the world and it is especially strong in the Pacific Northwest. Many homeowners have reclaimed their turfgrass parking strips and are turning them into gardens. These urban island ecosystems are critical for the tiny creatures that inhabit them. When connected they serve as mini-wildlife corridors along our streets that allow safe passage into backyards and parks to foster genetic and ecological biodiversity. I invite you to take a walk around Seattle’s Capitol Hill neighborhood where you will see a plethora of parking strip gardens, raised beds, and pollinator corridors that will inspire and delight you. If you happen to be in Portland, you might run across a Pollinator Parkway; these vibrant verges are the brainchild of Sherrie Pelsma, who has flipped the strip on over 11,000 square feet of turfgrass. Her free Do-it-Yourself Manual “Small Spaces. Big Impact” includes lists for both shade and sunny strips in skinny and wide versions, with a focus on native plants and pesticide-free care. Thank you Sherrie, for your generosity and vision! Every arthropod-friendly parking strip helps to strengthen local populations and make them more resilient. The Xerces Society says this is good news for all fauna, but especially native bees. Native plants attract native pollinators and do not require constant maintenance, copious amounts of water, or chemical supplements to keep them "healthy". 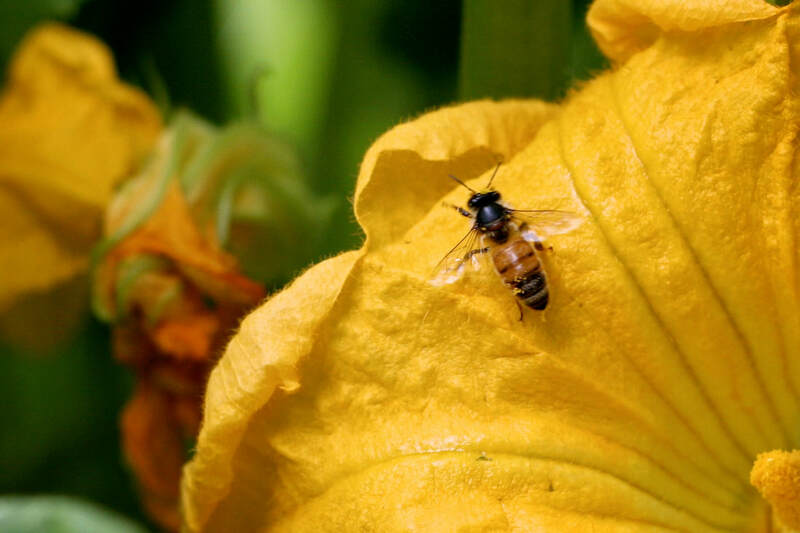 In addition, our parking strip gardens provide us with not only herbs, flowers, berries, and greens, but also the opportunity for daily close-up interactions with the bees, butterflies, moths, beetles, worms, snails, and spiders along the sidewalks of our urban neighborhoods. Backyard Wildlife Habitat: a hedgerow of native plants will provide food, nesting sites, and cover for birds, and this not only benefits the birds and other wild urban creatures but your family as well. When we plant trees and shrubs that provide habitat for birds and grow flowers and fruits that will attract a diversity of pollinators, we are taking actions that will lead to the healing of our fragmented and degraded urban spaces as we nurture our relationship with the ecosystems in our backyards. Inquiry Research: which parking strip planting has the greatest diversity of species? and, which plantings will attract the largest number of arthropods? 4. Don't use herbicides or pesticides! 10. Encourage your children to play outside, and you should too!